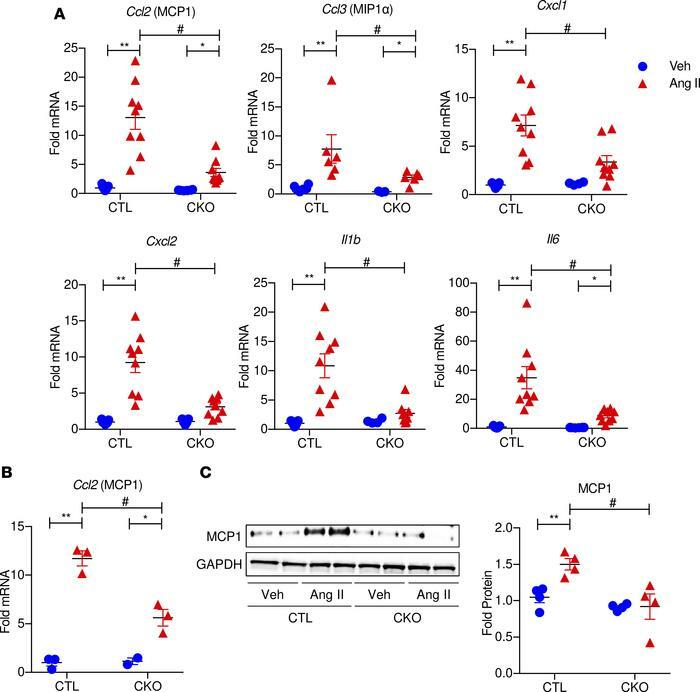 Deletion of CaMKIIδ in the cardiomyocyte attenuates Ang II–induced inflammatory gene expression in the heart and monocyte chemotactic protein 1 expression in the myocyte. (A) mRNA expression of monocyte chemoattractant protein 1 (Ccl2/MCP1), macrophage inflammatory protein 1α (Ccl3/MIP1α), CXC motif ligand 1 (Cxcl1), CXC motif ligand 2 (Cxcl2),IL-1β (Il1b), and IL-6 (Il6) in ventricular lysates of Camk2dfl/fl control (CTL) and cardiomyocyte-specific CaMKIIδ KO (CKO) mice infused with saline (vehicle [Veh]) or Ang II (1.5 μg/kg/min) for 1 day as measured by qPCR (n = 6–9/group). (B) Ccl2/MCP1 mRNA expression in adult mouse ventricular myocytes isolated from control and CKO mice after 1-day saline or Ang II infusion as measured by qPCR. Hearts were enzymatically digested, and resultant cell suspension was allowed to sediment by gravity. Supernatant was aspirated and pellet washed 2 times before being processed for RNA extraction, cDNA synthesis, and qPCR (n = 3/group). (C) Western blot and quantitation of MCP1 protein in ventricular lysates of control and CKO mice at 1 day of Ang II infusion. GAPDH, loading control (n = 4/group). Two-way ANOVA was used for all comparisons. *P < 0.05 vs. Veh; **P < 0.01 vs. Veh; #P < 0.05 CTL Ang II vs. CKO Ang II.